Mr. Hodgson’s original (and ridiculous) conceit is still intact on “Mystery Science Theater 3000: The Return.” A hapless pilot aboard an orbiting spacecraft (the Satellite of Love) is forced to watch the endless parade of B-movies as part of a diabolical experiment conducted by mad scientists. To keep himself company (and to stave off madness), the pilot creates two robot pals, Tom Servo and Crow T. Robot, who join him in tossing incredulous zingers at the screen as the movies unspool. While several former cast members will return in cameos, including the men who voiced the original Tom Servo and Crow T. Robot, the three wisecrackers and supporting cast are all new. 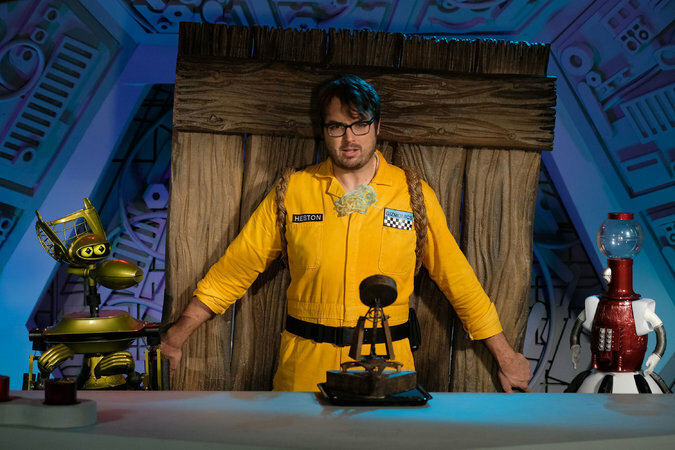 Jonah Ray stars as the hapless pilot, Jonah Heston; Baron Vaughn (Servo) and Hampton Yount (Crow) voice his two robotic friends. The new version will also have something else the original lacked: big-name stars. In addition to the show regulars Patton Oswalt (“Agents of S.H.I.E.L.D.”) and Felicia Day (“Supernatural,” “The Guild”), who play the series villains, guest stars will include Jerry Seinfeld, Mark Hamill, Joel McHale and Neil Patrick Harris. 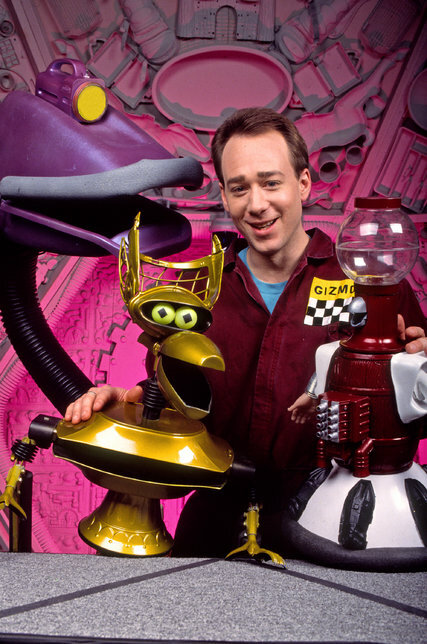 Joel Hodgson in the original “Mystery Science Theater 3000,” with Crow T. Robot (left) and Tom Servo. Last September, the cast and crew were filming an episode of the show here at the Apache Studios, which was swarming with producers, puppeteers, artists and deep-pocketed Kickstarter donors. (In one month, more than 48,000 backers contributed $5.7 million to the cause.) Outside the soundstages, freshly painted brains were drying in the warm California sun; in a nearby prop room were extra robots — full-color ones for the skits, all-black ones for the signature theater scenes, when the characters are shown in silhouette. The featured movie is top secret (the showrunners would rather that viewers come to the movies cold), but it involves a large reptilian monster (not Godzilla) trashing a large metropolitan area (not Tokyo). The three rehearsed a related skit in which Servo tries to persuade Crow to help him open a monster-themed nightclub, complete with monster-created disasters. Crow is skeptical. 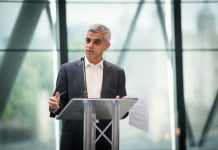 “People don’t want to be crushed to death,” he countered, sensibly. Although the show often feels as if it were created on the fly, all the episodes are scripted. 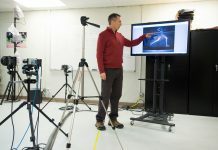 “A lot of people assume it’s improvised, which would be crazy, because we’d just be talking over each other all the time,” Mr. Yount said. Riffing aside, the series lives or dies on the featured movies. Over its 10-season run, the show has favored forgotten monster movies, schlocky sci-fi and martial arts films, with a particular emphasis on battles royale between unlikely opponents (“Santo vs. las Mujeres Vampiro,” “Santa Claus Conquers the Martians”) and small animals made terrifyingly large (“Attack of the Giant Leeches,” “The Killer Shrews”). And not just any forgotten movie will do. At the very least, it has to have copious amounts of dead air to accommodate all that riffing, and a decent print to accommodate today’s giant HD television screens. In February, Netflix and executive producers from Shout! Factory presented a sneak peek of the first episode at the Cinerama Dome in Hollywood. Nearly all of the cast and crew and producers were there, as well as executives from Netflix and scores of Kickstarter contributors, some of whom had pledged up to $25,000 to be there.